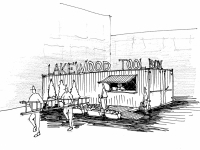 LakewoodAlive hopes to launch the Lakewood Tool Box next spring. In an effort to finalize necessary funding to introduce this program in May 2019, LakewoodAlive has launched a month-long Lakewood Tool Box Crowdfunding Initiative aimed at raising $12,500 by October 17. A wide variety of perks are available to community members who participate in this crowdfunding effort, ranging from LakewoodAlive window stickers to complimentary tool rentals to tool naming rights. Visit LakewoodAlive.org/ToolBox to view these perks and offer your support.